by Brianna Crandall — June 15, 2018 — Globally recognized furnishings and technology provider Herman Miller earned both a Gold and a Silver award this week in the prestigious Best of NeoCon Competition this week at the Neocon 2018 contract furnishings show in Chicago. The award-winning products in the Seating: Ergonomic Desk/Task and Healthcare Guest & Lounge Seating categories are highlighted below, and additional products will be covered in a future FMLink article. Designed by Berlin-based Studio 7.5, Cosm is the Gold award winner in the Seating: Ergonomic Desk/Task category and Herman Miller’s first task chair with an automatic tilt. It also has what the company says is the industry’s first suspension armrest. Initially revealed in Milan during Salone Del Mobile 2018, the chair will be available for order worldwide later this summer. To experience Cosm is — as Studio 7.5 says — “to forget gravity.” And now people can have that comfort and support no matter how many settings they sit in throughout the day. As more organizations move toward shared workplaces and workpoints, and people enjoy the freedom to choose the setting based on the work they need to do, one thing hasn’t changed: the need for ergonomic support, says Herman Miller. Cosm is designed to offer exactly this consistency, providing comfort and performance not only for individuals but also as a shared chair. Cosm rapidly adjusts to whomever is sitting in it using its hidden “engine,” the Auto-Harmonic Tilt — a culmination of two decades of design research and engineering that further deepened Herman Miller’s understanding of how people sit and work. Hidden in Cosm’s gearbox beneath the seat is the technology that gives the feeling of balance and comfort. The Auto-Harmonic Tilt instantly and automatically provides continuous support and fluid movement corresponding to the person’s body, posture, and seated position. According to Studio 7.5, other chairs on the market with automatic tilts achieve this simplicity by compromising the experience — relying on systems that cause the body to follow the tilt mechanism, rather than the tilt following the body. Cosm’s Auto-Harmonic Tilt is able to understand how much tension to provide based on the downward force exerted by the person and it provides the same experience for everyone, regardless of body type or seated position. Perfecting the tilt mechanism — to give users the seamless experience Studio 7.5 was aiming for — involved years of building and testing full-scale prototypes. Studio 7.5’s iterative process was reportedly similar to that of famed Herman Miller designers Charles and Ray Eames, with a contemporary twist. Studio 7.5 built and tested countless prototypes in-house using a new 3D-printing technology blending aluminum dust and resin to create mechanically sound components, along with hand sculpting, tweaking, and testing. Cosm’s ergonomic support goes beyond mechanics. The frame and fabric suspension work in tandem with the Auto-Harmonic Tilt. 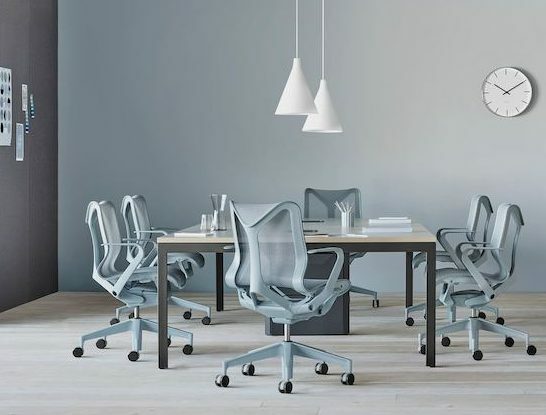 The continuous suspension material, Herman Miller’s new Intercept, forms to each person’s unique contours, delivering dynamic, uninterrupted support. Intercept delivers thermal comfort while standing up to years of use. The hourglass-shaped suspension attaches to the frame, creating areas of high- and low-tension that provide comfort and support where it is needed most — regardless of body size or position in the chair. Cosm’s arms also make it unique. In fact, the use of suspension material over a solid form make its Leaf Arms an industry first, claims Studio 7.5. Precision-designed for comfort, Leaf Arms cradle the elbow, supporting its delicate nerves even in a variety of positions. In addition, the angle of the Leaf Arms prevents them from colliding with work surfaces. For people who would rather have a more traditional chair arm, Cosm is also available with fixed arms and height-adjustable arms, as well as without arms. Cosm’s unique “dipped-in-color” aesthetic required a great deal of color engineering to achieve a precise color match on its metals, plastics, and fabrics. The results of these efforts are three all-over hues that are fresh and compatible with Herman Miller’s color palette for other products throughout the family of brands. As interior walls come down and sightlines open up, the dipped-in-color options allow designers to create visually interesting and harmonious solutions for floorplates of all sizes and layouts. Cosm’s six shades — three new saturated hues and three classic Herman Miller neutrals — provide options for everyone. Canyon (a bright red-orange) is the boldest color, while Glacier (a soft, light blue) and Nightfall (a deep navy) serve as “new neutrals” in place of the neutral greys so common in today’s workplace. Cosm is also available in the more familiar neutral options: Graphite, Carbon, and White (dark, medium, and light shades of grey), as well as mix-and-match variations of all of the above. Cosm will be available for order through Herman Miller’s global Dealer/Retailer Network and through the Herman Miller Store beginning this summer. For more information, visit the Cosm landing page. 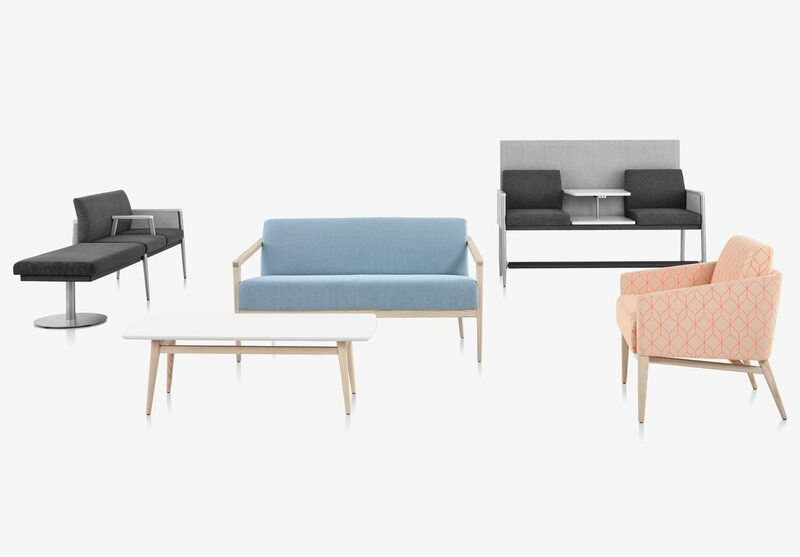 The company’s Nemschoff brand also expanded the Palisade Collection, which took home Silver in the Healthcare Guest & Lounge Seating category, and Herman Miller Healthcare introduced Mora. According to the company, these products solve frequently overlooked problems in the healthcare environment — storage and public waiting spaces. Designed by Jess Sorel, the Palisade Collection from Nemschoff is designed to put the guest first. In its 2014 debut, Palisade included furnishings for patient rooms that encourage guest participation in the healing process by creating a sense of belonging, a connection to the broader care team. This year, Nemschoff is unveiling new additions to the Palisade Collection that extend these inclusive qualities to lounges, waiting rooms, and public spaces, areas where innovation has been largely ignored. Palisade gives people of all ages and abilities choices for accommodation, as its unifying visual language gives interiors a cohesive look. With a design based on consideration of the emotional and physical needs of people in healthcare welcome and waiting spaces, the collection breaks the “sameness” found in most institutional settings, allowing space planners to achieve an interesting topography and a residential vibe. Across the guest areas, Palisade accommodates postures from lounging to perching — even playing. And power access is integrated at all times. Products are made with high-quality, durable materials to withstand the test of time and traffic. The Collection is intentionally designed to accommodate scooters and wheelchairs. The seating addresses individual, group, or booth settings. The tables range from occasional to work-intensive. The screens subdivide space to offer privacy and a sense of security and help guide traffic patterns. Every component is aesthetically complementary to the others. This continuity brings a new level of expression to welcome spaces — and a new opportunity to delight guests in a place where they normally have low expectations. This is key for health systems embracing the importance of their brand and acknowledging the role of their facilities in shaping the experience, points out Herman Miller. Flexibility is another important consideration for health systems. Driven by technology requirements and evolving best practices in treatment, healthcare environments not only need to keep up with the demands of today but must also rise to tomorrow’s challenges — and do so with a constant eye on improving outcomes. Designing healing spaces to be adaptive gives healthcare organizations the flexibility to address these challenges in both the short and long term. Originally launched at Healthcare Design, where it won a Nightingale Silver Award, Mora is a versatile alternative to casework designed to fit together precisely for a clean, architectural look and the capability to customize. Mora designer Colin Nourie explored how aesthetics can actually add to the functionality of a space, which led him to design Mora, Herman Miller’s broadest-use and most personalized casework system. The idea behind Mora is orderly fashion, providing a beautiful, intuitive way to organize, with storage choices that keep some supplies concealed and others readily accessible. Mora also puts digital tools — including the wires — in their place, so a caregiver and patient maintain eye contact without the distraction of technology, which helps elevate the experience for everyone. As for style, Mora fits flush to the wall for a clean architectural appearance. The edges are laser cut, making them consistent and precise. And Mora goes a step beyond the case with a backsplash and sink — important additions to any infection prevention program. In short, Herman Miller Healthcare says Mora delivers value, precision, quality, and durability; cost and aesthetic scalability; flexible customization; and solutions that work across the healthcare landscape, including uniquely dimensioned spaces. For more information, visit the Palisade Collection or Mora landing pages on the Herman Miller website.